President Lincoln has inspired generations of Americans, demonstrating that character is the heart of the American Dream. Not only did his presidency bring about the end of slavery, he carried the United States into cultural maturity. 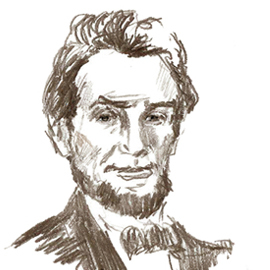 Lincoln was open to ideas, and he believed in American ingenuity. His presidency flourished from his relationships, such as with his law partner William Herndon, and especially with the Abolitionist leader and author Frederick Douglass. Douglass gave Lincoln a first-hand account of slavery, thus empowering the abolition of slavery, at last. Lincoln's relationship with the photographer Mathew Brady is well known, through the many images Brady sent from the field during the Civil War. Lincoln's relationship with Brady then introduced the President to other innovative Americans, photographers and artists alike. Brady's prominent studio in New York City was a meeting place for other photographers and artists. Amongst these new young professionals was painter Francis Bicknell Carpenter. In 1864, through Brady and political connections, Carpenter spent six months at the White House preparing the portraits of Lincoln and his cabinet, with the goal of painting the heroic picture: First Reading of the Emancipation Proclamation of President Lincoln. This painting commemorated the finest moment in Lincoln's presidency, when he presented his speech to his own Cabinet. This tribute was later broadcast in the form of a mass produced engraving, seen throughout the country, allowing Lincoln to reach his people as no other president had before. Francis Carpenter was a self-taught artist, a natural aristocrat like Lincoln and his colleagues. Carpenter was also a spiritual man, and an ardent Abolitionist. In the 1860's, perhaps at the New York studio of Mathew Brady, the artist Edward Bannister showed his work to Carpenter, who encouraged him to devote himself to painting. That they were both self-taught, spiritual artists, both activists in the Abolitionist Movement made this all the more meaningful to Bannister. This rare encouragement was a turning point in Edward Bannister's career.